The Clarendon Alliance is producing the 2017 Clarendon Mardi Gras parade on Tuesday, February 28 starting at Wilson Blvd and N. Barton Street and will continue up Wilson Boulevard, past Liberty Tavern and end on N. Irving Street. Clarendon has for a number of years brought the community together to celebrate Fat Tuesday with an annual parade and nightlife celebrations. After the parade, there will be the Second Annual Mardi Gras Ball at Clarendon Ballroom. There will be live music, great food in the Fat Tuesday tradition with beer, wine and punch. The Mardi Gras Ball is a ticketed event, which along with parade entry fees helps the Clarendon Alliance defray their substantial parade expenses. A portion of the proceeds from the Ball will be donated to our nonprofit partners, Arlington Independent Media, and WERA-FM 96.7. Purchase Mardi Gras Ball Tickets here. 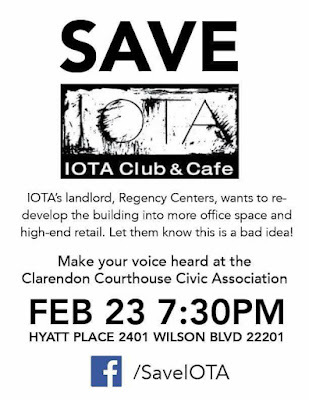 I nearly had a heart attack when ArlNow.com broke the story of the possible future closing of Iota given the developer Regency Centers plan to the demolish 2800 Clarendon building. Since then, the developer who also owns Market Common Clarendon has responded saying they have "been actively working with the owner of IOTA since we acquired the center to do what we can to keep her as a part of the redevelopment." Despite those assurances, local fans of the small live music venue that has graced our neighborhood for decades have created a petition to Arlington County to Save Iota and oppose the demolition plan. 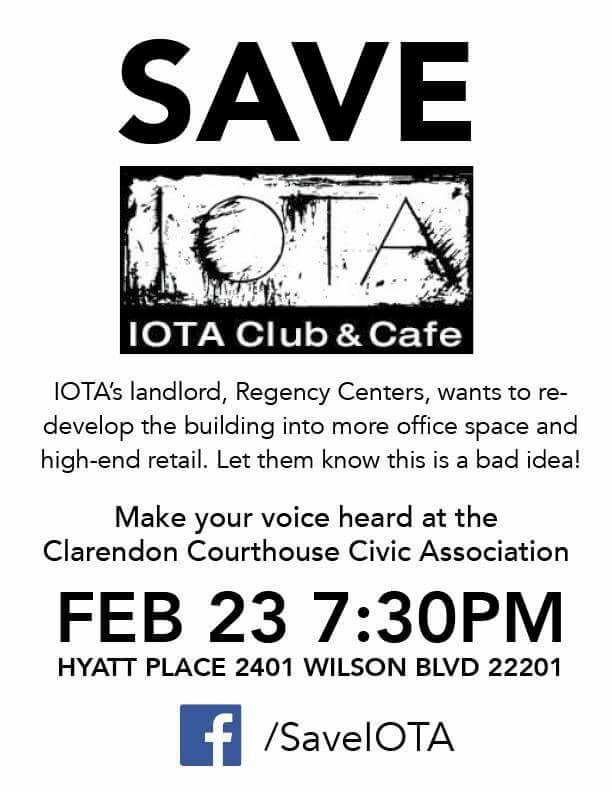 The next Clarendon Courthouse Civic Association meeting is happening this Thursday February 23 at 7:30pm at the Hyatt Place hotel in Courthouse (where Wilson Tavern used to be). Come out to the Civic Association meeting Thursday night to voice your opinion and talk directly the developers. With the recent rash of local restaurant closings last year I don't think the community can stomach another loss, let alone a long time historical staple like Iota Club and Café. A former Clarendon resident created the promotion company Rabid Events to help fundraise for local non-profits. Rabid's first event is the bar crawl for the Fairfax Boxing Club being held this Saturday February 11 2-8pm in Reston Town Center. Starting at World Of Beer, portions of the sales will go to support the Fairfax Boxing Club which strives to mentor at-risk youth through boxing and to put them on a track of health, fitness, and community involvement. FBC will receive 25% of every sale and a percentage of restaurant sales as well. Tickets are $20 at the door or $15 online. On Thursday, February 9th, join the crew at A-Town for the grand opening of Silent Disco Thursdays! Watch three DJs compete and go head to head at the same time while you choose any of the three on your headphones and rock out to whichever you choose! Tickets are just $5 for your headset for the night. 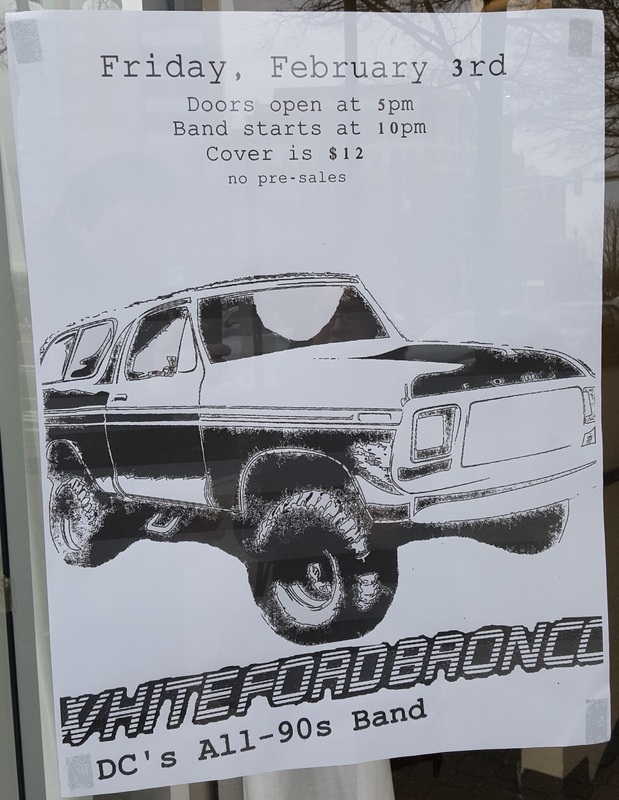 One of the best 90s cover bands out there White Ford Bronco will be playing Clarendon Ballroom on Friday, February 3. Since 2008, this five member band has played all around the DC area at Clarendon Ballroom, Clarendon Grill and Truckeroo amongst over places. It's no surprise they were named Best Local Cover Band in Washington City Paper earlier this year, as their energetic renditions of your favorite songs and Gretchen's vocals will make you an instant fan of theirs. Music stars at 10pm and cover is $12.